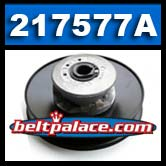 Comet 217557A Secondary Pulley. New OEM Lennartsfors/Jonsered PART, 20 DVN, 17mm Bore, 7" Dia. Driven Pulley. Genuine Comet Industries part made in USA. 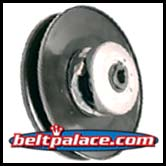 DRIVEN PULLEY FOR JONSERED (PART: 531 00 16-99), JH125/JH129 IRON HORSE (Lennartsfors). 17mm Bore, 6" Dia. COMET 217559-A.